Forget SOPA. The biggest online intellectual property story last week was the shutdown of a website offering downloads of the cartoon My Little Pony: Friendship is Magic, which shook the burgeoning "brony" community to its core. Bronies (bro+pony) are adult male fans of the new series launched in 2010 based on the classic ‘80s My Little Pony toy that [spoiler] your mom secretly threw out your collection of when you went to college. If you think bronyism sounds like something only a serious pervert living in his mother's basement would be into, you're only about 30% correct. To address your immediate question: it's not ironic. It's nerdy guys who genuinely enjoy an animated series about ponies. The show has a legitimate appeal to older audiences—high production values, snappy dialog, and a heartwarming message. But the online fan culture of bronies grew out of 4chan, so they have a computer nerd vestigial tail of Mountain Dew, anime appreciation, chronic virginity, and cyberbullying. Bronies have their own news sites, fan forums, and even a healthy amount of fan art of ponies doing unspeakable sexual acts on Tumblr. They've had real life meet-ups, and an upcoming BronyCon in New York will feature appearances by voice actors from the show. In the pecking order of internet weirdo subcultures, bronies fall somewhere between Ron Paul supporters and furries. For this reason, I like to do a search for "bronies" on Twitter every now and then to see if there's anything worth ironically retweeting. It was while doing this search that I stumbled onto the piracy scandal unfolding between trademark holder Hasbro and a popular brony site. Until last week, PonyArchive.org was a keystone of the Brony community. The fan site offered free full episodes of My Little Pony: Friendship is Magic, and had around 30,000 visitors a week. PonyArchive's videos were much higher quality than YouTube, making it the best destination for fans who didn't want to buy episodes on iTunes or wait for the DVD release in February. It also serviced international fans who couldn't access the show on TV or iTunes in their country. magic we feel that we're protected by princess Celestia herself. Also, we are not based in the US - so US law does not apply to us. learn about accepting, friendship and happyness too. Today we learned that Hasbro, are no real bros. They are indeed proper wankers. We were only trying to spread the word that friendship is magic, and then these twats came along with their fancy threat-letters. Please, banish HasNObro to the hell-holes forever. These harsh words sparked a rift in the brony community. 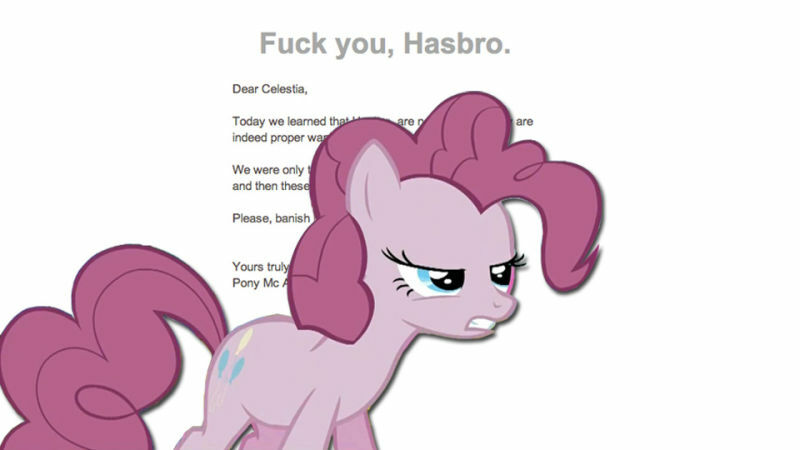 Had PonyArchive reacted immaturely, or was it a justified response to a snub by Hasbro? EquestriaDaily, the most popular brony blog, had 844 comments on its post about the crack-down. "Being a brony, I am ashamed to be associated with people that choose to answer in such an arrogant and self-entitled manner. It's childish, that's what it is. The last thing this fandom need are people like this." "Not cool, PonyArchive. You're failing to love and tolerate the very people who introduced the love and tolerate rule. Shame..."
Ponyarchive is down. Guess I'll just use The Pirate Bay. It's not like I can buy the DVDs or any episodes from iTunes. PonyArchive's official response in the comments? "Well, we did this for teh lulz." Illegal torrents of episodes are still out there for motivated bronies and international fans, and there's little chance bronies are going away anytime soon. Right or wrong, one thing is clear: Don't get between a man and his Ponies. Katie Notopoulos is the creator of the blogs Sorry I Missed Your Party, Dumb Tweets at Brands, and Marina Abramovic Made Me Cry. She's on Twitter, duh.